I'm sure we all have wonderful memories of making playdough sculptures when we were children, with these playdough recipes you can pass on the fun to your kids! Choose from the edible and non-edible varieties, and let the fun begin! 2. Take the dough out of the sauce pan and put it on wax paper to cool, cover with a damp cloth (I've used playdough out of the pan, just make sure it's cool enough for little hands). 3.Store your play dough in an air-tight container. 3.Store your play dough in an air-tight container in the fridge. 1. In a medium sized bowl, mix and knead all of the ingredients together... and you're ready to play! Use raisins, chocolate chips, pretzels or other yummy snacks to add to your playdough creations! Do not store or reuse this playdough, this is one time use only! Kids Party Cabin has kids party ideas that are so easy yet have the "WOW" factor. Each kids party theme is accompanied by ideas for kids party food, party games, decorations and activities. There is also a kids party entertainers directory in case you want a helping hand. Attention Preschool Educators! 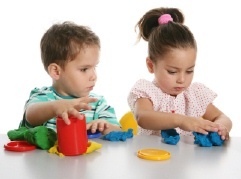 Check out these Preschool Resources - Lesson plans and activities for preschoolers including discussions on different preschool educational philosophy like Homeschooling and Montessori Method. Get Organized Mom! Family, finance, and home organization tips by moms who want to help other moms get organized so they can enjoy life to the fullest.